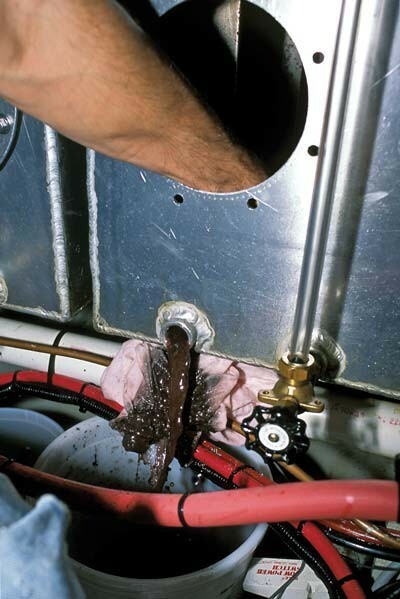 Fouling of diesel fuel tanks with asphaltene, water, and biological growth is a given, meaning that at some point in a vessel’s life, tank cleaning will be required. Having stuck my head, or entire body, into many contaminated fuel tanks, I’ve noted that to properly inspect or clean one out, you must gain access into every baffled chamber. No amount of fuel agitation, washing, or jet action can adequately clean all chambers. Manual, physical cleaning is necessary. Space around tanks is usually very limited and often negligible above, requiring side-access inspection plates. When engaged in boat construction projects, I routinely specify the inclusion of such ports, affording access to each and every baffled chamber. From a vessel owner’s or crew’s perspective, such ready access can be a godsend, particularly when cruising far from familiar service facilities. While it is always desirable to include such ports in the original construction, in far too many cases, stock tanks from builders and tank fabricators either have no ports or just one, making complete access impossible. Fortunately, inspection port kits are available in a range of sizes and materials for aftermarket installations, but they can be costly. I’ve installed hundreds of such port kits, all leak- and trouble-free; they have been a boon to the aftermarket marine industry. In many cases, however, it is impossible to install access ports on the tank’s top or horizontal surface, particularly in the engineroom, where the gap between tank and overhead is often minimal or nonexistent. 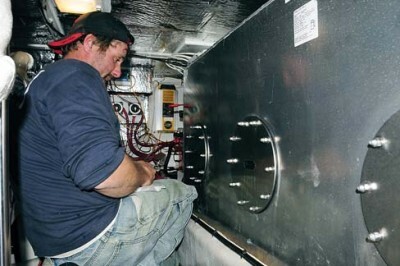 Fortunately, for diesel fuel tanks, American Boat & Yacht Council (ABYC) standards have allowed the installation of such ports on tank sides, making it possible to access tank interiors even when no access is possible from the top. Sludge in fuel tanks must be periodically removed; this side-access port makes it a relatively easy, if dirty, job. When queried, staff at ABYC indicated that this change was made to harmonize with standards of the Inter-national Organization for Standardization (ISO). While the difference between the ISO and ABYC standards is seemingly small, the ramifications are considerable, potentially moving many currently compliant vessels and designs into noncompliance. The standard EN ISO 21487:2012+A1:2014 Small craft—Permanently installed petrol and diesel fuel tanks, 4.3.10, reads, “Diesel tanks shall be equipped with inspection hatch(es) having a suitable diameter of at least 120mm at suitable posi-tion(s) for cleaning and inspection of the lowest part(s) of the tank. The hatch must remain accessible when the tank has been installed in the craft. The hatch(es) may be located on the top or side of the tank.” Once again, the emphasis is mine. It’s clear, therefore, that the quest for harmonization, while well intentioned, in this case does not require that inspection ports be installed on tank tops alone. I can think of no reason for this alteration of the ABYC standard. The good news is the ABYC standard has a compliance date of July 31, 2016, and therefore it’s not too late for the standard to be changed. If you agree that it’s too strict, and will unnecessarily push countless vessels out of ABYC/NMMA compliance, contact Brian Goodwin at bgoodwin@nullabycinc.org to request that the wording of this standard be changed (back), to allow for side-mounted inspection ports.